I am going to let you in on how to get your very own FRUIT coupon(s) for strawberries, raspberries, blueberries, and blackberries. It is with Driscoll’s! 1. Become a Driscoll’s Consumer Panel Member HERE. 2. Complete a Survey online. 3. Enter the 16 digit code on the back of your Driscoll fruit package. 4. Receive a Coupon for more fruit through e-mail. As a panel member, we would like to hear from you regarding your thoughts and opinions about Driscoll’s berries all year-round! As a panelist, you will receive coupon incentives for every completed survey*. Each year panelists will have the opportunity to qualify for incentives as outlined in the tiers. The more surveys you complete the bigger the incentive! Bonus: Every time you complete a survey you will automatically be entered into a monthly drawing to win a $100 gift card. Your feedback is important to us and helps guide our team to grow Only the Finest Berries™ for you and your family to enjoy! Your survey responses are shared across all parts of our organization from our plant breeding and R&D group to our quality assurance teams. As a valued panelist, you are given opportunities to participate in additional research studies and entered in to win a variety of quarterly prizes. Receive a coupon by filling out up to two surveys per day! Your opinion is important to us, and your feedback will help us to continue to bring you Only the Finest Berries ®. (You can do two surveys a day. Also, you are allowed two prints per coupon on one survey! It’s like getting a FREE extra coupon from your survey. Score! We wanted to advise panel members of important changes to the program that will be effective beginning Tuesday, January 1, 2019. Click the link below for more details on Driscoll’s 2019 Advisory Panel program and frequently asked questions. There are three tiers; you automatically get assigned as a panel member when you sign up. You have the rest of the year to move up the tiers by completing surveys before you are reset at the beginning of the new year. 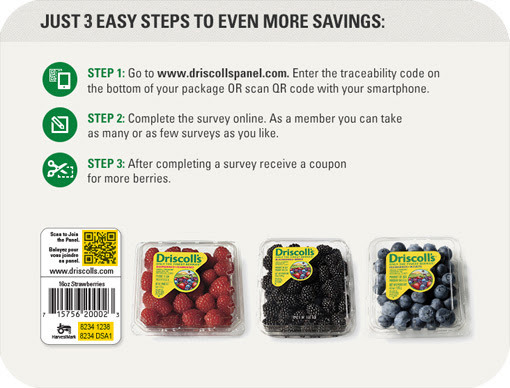 Get Savings on Fruit with Driscoll’s! Leave me a reply and let me know, thanks! Please share this post with your family and friends, so they can get Driscoll fruit coupons too!